In the third book of the Coraggio! 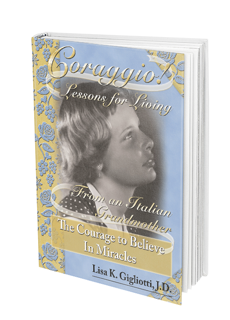 series, the author again shares the Old World wisdom learned from her beloved Italian grandmother, adding to the first three lessons presented in Coraggio! 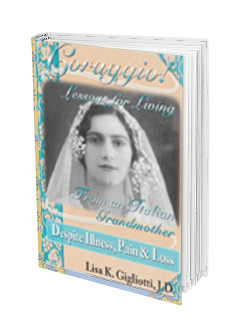 Despite Illness, Pain, and Loss, and to the fourth lesson in Coraggio! Courage to Believe in Miracles. 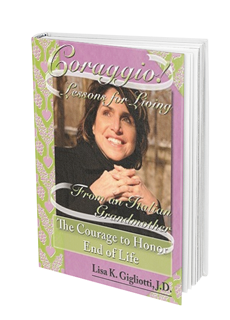 Faced with the realization that pain caused by ravaging rheumatoid arthritis and tragedy might be a lifelong daily companion, the author reaches for courage inspired by her grandmother. In this fifth Coraggio! lesson she discovers within the keys to conquer physical and emotional pain, and achieve a fulfilled life of purpose and joy.